We have said so long to the many migrating species and have welcomed our winter residents. 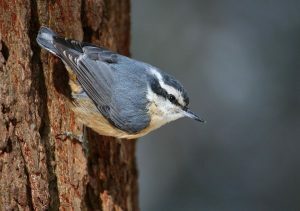 Have you been keeping your eyes out for the Red-breasted Nuthatches? There have been a lot more of them in our area than in past years! Many have been banded this fall at Sand Bluff. I want to say thank you to all the dedicated volunteers who have been collecting data about the birds and thank you to the many donors who support our organization. This fall we had several people join us for our annual Donor Breakfast in October where our volunteers created a home cooked feast to say a huge “Thank You” to everyone who helps make our data collection possible. Though the fall feels quiet with the dormant plants and everything waiting for the spring thaw, at Sand Bluff, we catch up on many tasks during the long winter hours. We hope to see you in Spring when we re-open!